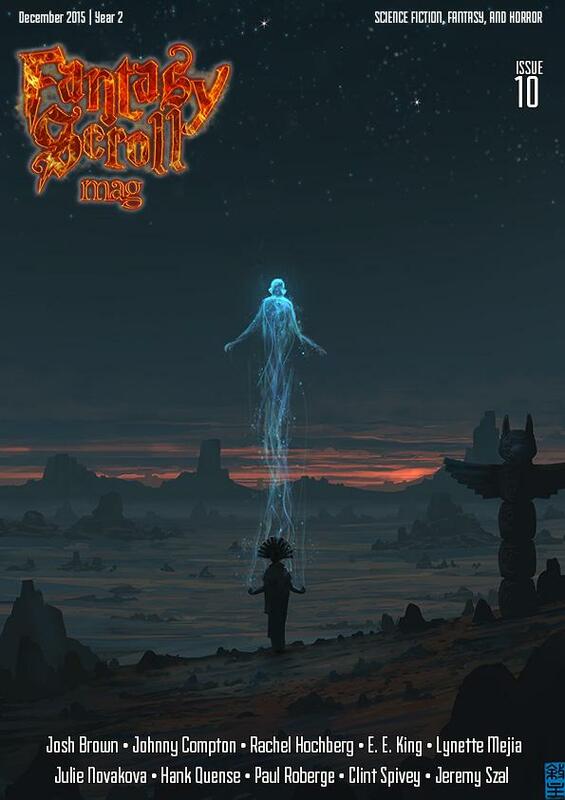 The tenth issue of the online-only Fantasy Scroll Magazine, cover dated December 2015, is now available. In his editorial Iulian Ionescu’s celebrates the release of their Year One anthology, Dragons, Droids and Doom, and points out that in Year Two Fantasy Scroll published 55 short stories from 53 authors, totaling 181,000 words of fiction. We start with “The Genie and the Inquisitor,” a new and fresh take on the genie myth by Johnny Compton, partly funny and partly horrific, but definitely bone-chilling. “The Hummingbird Air” by Paul Roberge is next, a fantasy story that follows the path of a boy and his growth into a man, ready to deliver a life-long awaited revenge. Next is “The Empty Faux-Historical Residential Unit” by Rachel Hochberg, a science fiction story that takes place in a future dominated by robots, but brings us back into an old-fashion London scene. Jeremy Szal delights us in his epic fantasy story “Last Age of Kings”; there’s a lot of bloody action in this story, but also depth of character, all happening in an interesting setting. “Kara’s Ares” is another science fiction story, by Clint Spivey, who follows the struggle of a mission to Mars and its aftermath. For some comic relief, we follow with “Protecting Nessie” by Hank Quense, who tells the story of three sisters with magical powers, fighting hard to defend the pet of their queen. “Dancing an Elegy, His Own” by Julie Novakova is next — a science fiction story that focuses more on the relationship between characters than on the setting, creating an emotionally loaded atmosphere, and closing with an unexpected twist. “Lost Souls” by E. E. King is the shortest story in this issue, but it’s packed with emotion and unusual developments. “The Answer” by Lynette Mejía concludes the short story portion of the issue, presenting the quest of one man that ends in quite unexpected way. We close the fiction section with part one of the next installment in Shamrock’s adventures, written by Josh Brown and illustrated by Alberto Hernandez. In the non-fiction section, we have an interview with author Matthew Kressel and author and editor Maurice Broaddus. We then spotlight the artist who created this issue’s cover, Joshua Hutchinson. We end with a book review for The SEA is Ours, by Julie Novakova, and a movie review for the popular flic The Martian, based on the book with the same name by Andy Weir, written by Mark Leeper. See the complete contents of the issue here. Fantasy Scroll Magazine is edited by Iulian Ionescu, Frederick Doot, and Alexandra Zamorski, and published bi-monthly in Mobi, epub, and PDF format; issues are also for sale through Amazon, B&N, Smashwords, Kobo, Weightless Books, and Google. Individual issues are $2.99, a 4-issue subscription is only $9.99. Learn more at their website. 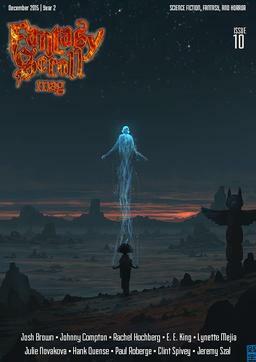 The cover this issue is Soul Ascending by Joshua Hutchinson. We last covered the magazine with issue 9. See our January Fantasy Magazine Rack here, and all of our recent Magazine coverage here.